Investors looking to get inside details on Apple’s business and enthusiasts hoping for a hint of future products are set to get their quarterly dose of frustration Tuesday. Following its earnings report, Apple is set to kick off a conference call with analysts at 2 pm PT. AllThingsD will have live coverage. 1:59 pm: Just waiting for the call to get going. Worth noting that 31 million iPhones was well ahead of expectations while 14 million iPads was less than most were expecting. Overall sales and earnings were ahead of expectations. 2:02 pm: CFO Peter Oppenheimer kicks things off by noting that it was a June-quarter revenue record, up one percent from the prior year. Actual sales to customers were even greater, Oppenheimer said, as inventory decreased during the quarter as contrasted with a year-ago increase in inventory. 2:05 pm: Oppenheimer makes a subtle knock on the recent report that older iPhones account for half of sales, noting that iPhone 5 remains by far the most popular iPhone, though older iPhones remain strong sellers, too. 2:06 pm: Oppenheimer doing his quarterly noting of businesses and government agencies that are using iPhone. It’s not just personal productivity, he adds, noting tens of thousands of custom business apps have been created. The iPhone has a 62.5 percent share in U.S. businesses, according to IDC, Oppenheimer said. On the iPad front, Oppenheimer notes that inventory again played a factor, with the company reducing inventory in this year’s June quarter and increasing its inventory in the year-ago quarter. On the business front, lots of companies are using iPads, Oppenheimer said. Eli Lilly, SAP and others have deployed more than 20,000 iPads apiece, Oppenheimer said, and the U.S. Agriculture Department is using a bunch, too. 2:09 pm: On the Mac front, Oppenheimer reiterates redesigned, made-in-the-USA Mac Pro coming later this year, but no further detail. OS X Mavericks due this fall. 2:13 pm: The iTunes store generated $4.3 billion worth of billings, with its best week at the end of the quarter. Revenue for Apple was $2.4 billion, up 29 percent from a year ago. 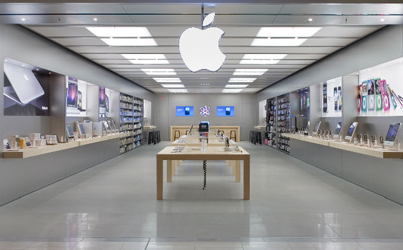 2:16 pm: Apple’s retail stores drove revenue of $4.1 billion, roughly the same as a year ago. Apple now has 408 stores and expects to open nine new stores in the current quarter. With a few more stores open this year than last, revenue per store was down somewhat from a year ago. Apple has $146.6 billion in cash and short-term securities. 2:20 pm: Guidance: Revenue of $34 billion and $37 billion, with gross margins between 36 percent and 37 percent. Oppenheimer reiterates that the company is hard at work on products for the fall and next year, but, naturally, gives no further details. 2:21 pm: “We are on track to have a very busy fall,” Oppenheimer said, declining to go into more detail on how new products will affect profit margins. 2:23 pm: CEO Tim Cook said long-term growth will come from new products in both existing and new categories. There’s also the opportunity for expansion in other areas, such as sales to corporations. “I think we have lots of growth opportunities,” Cook said. Cook doesn’t subscribe to the notion that high-end smartphone growth is stagnating. 2:26 pm: As to whether iPad is losing share to rivals, Cook noted 84 percent of tablet Web traffic coming from iPads according to a just-released study. 2:28 pm: Asked about declining average selling prices for iPhone, Oppenheimer said that four percent year-over-year decline was a result of both the mix of iPhone 4 sales and foreign currency issues. A number of developed and emerging markets were especially strong, Cook said. However, he noted that China was weaker in the quarter. Hong Kong was down significantly, while mainland China was up — though not as much as it had been in recent quarters. 2:34 pm: Apple asked about whether it might do a trade-in program. “We haven’t announced anything relative to a trade-in program,” Cook said, so anything else is rumor. He notes that iPhones do hold their value, and lots of other folks are doing programs. 2:39 pm: Analyst subtly tries to get Cook to talk about whether Apple could benefit from a product geared toward entry-level buyers. 2:41 pm: Asked about whether entry into new categories could allow Apple to grow its overall business enough to defy skeptics, Cook sounds an optimistic tone, but no specifics. “We’re working on some stuff that we are really proud of ,and we will see how it does,” Cook said. 2:45 pm: Asked whether guidance includes the launch of any new products during the quarter, Apple unsurprisingly declines to comment.